An inside-to-out golf swing is any swing in which the club swings to the right of the target line. 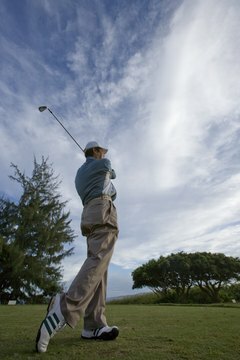 Golfers with an inside-to-out swing can push the ball out to the right, or hook the ball to the left. Poor alignment, too much shoulder or hip turn on the backswing and a downswing with too much hip slide will cause an inside-to-out swing. To get the club swinging down on the correct path you need to set up properly, have the proper shoulder and hip turn and rotate your hips toward the target as you swing down. Get these fundamentals down and you can straighten out your game. Set up to the ball with your hips and shoulders parallel to your target line. Your club face should be pointed directly at the target. Turn your left foot slightly toward the target to promote turning your hips on the downswing. Your right foot should be perpendicular to your target line. Swing the club back until your left shoulder is under your chin, if you are a right-handed golfer. This is the proper amount of shoulder turn on the backswing. Too much shoulder turn will cause the club to swing down from inside to out. Your hips should only rotate half as much as your shoulders on the backswing. Start your downswing by turning your hips toward the target. This will help start the club down on the proper path. Your hips should be turned about 45 degrees to the target at impact. 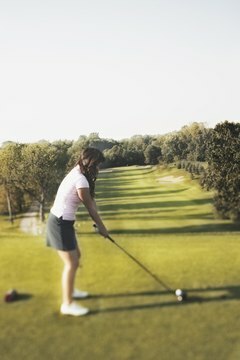 Swing the club right down the target line. Full hip turn at the finish. Finish your swing with your hips turned to face the target. Your chest and belt buckle should be pointing toward your target at the finish. A full hip turn at your finish is the end result of proper hip turn through the swing.